Geranium essential oil is made from rose geraniums, also known as Pelargonium graveolens. Although it is most often used as a treatment for skin conditions, there are many other benefits of geranium essential oil that you may not be aware of. So, we are going to look at the various health benefits of and uses for geranium essential oil, as well as how to make it. As mentioned, geranium essential oil can be used for many different medical conditions and health issues. And, some of them may even surprise you. Geranium essential oil has astringent properties that make it ideal for numerous topical uses, which includes reducing fine lines and wrinkles. Applying two drops of geranium essential oil to your face can help tighten the skin, minimizing wrinkles and the signs of aging. Similar to using geranium oil for wrinkles, it can also be used to help the appearance of muscle tone. Geranium oil’s astringent properties can also tighten the muscles and skin that covers them. This makes the skin appear less saggy, revealing more muscle tone. You can improve muscle tone by adding five drops of geranium essential oil to one tablespoon of jojoba oil and use it as a massage oil. Massage this oil combination into the muscle areas like your back, shoulders, arms, abdominals a few times a week for best results. Geranium oil is an effective natural deodorant because it works in two ways. First, geranium oil has antibacterial properties that kill odor-causing bacteria in the body. Secondly, geranium oil also smells very sweet and pleasant. You can create this deodorant simply by taking a spray bottle filled with water and then adding five drops of geranium essential oil to it. Despite its sweet smell, geranium essential oil can be used as a bug repellent due to its high citronellol content. Mix five or six drops of geranium oil with a water-filled a spray bottle, and spray the mixture on your skin. This same mixture can be used to help take the sting and itch out of bug bites due to the geranium oil’s antibacterial and antimicrobial properties. In addition to these uses, there are a number of health benefits that geranium essential oils carry as well. There are many geranium rose essential oil benefits to your overall health. From treating blood clotting to possibly helping with a neural disease like Alzheimer’s, there’s much this essential oil can add to your health. 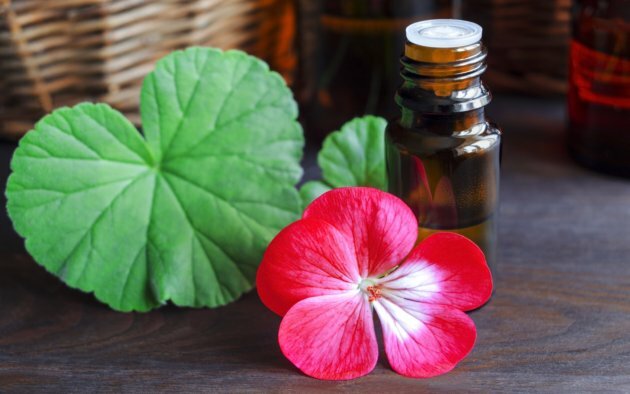 Geranium oil has a good quantity of monoterpenoid compounds like citronellol that gives the oil antibacterial and anti-inflammatory properties. Geranium oil is a natural diuretic which can help increase the amount of urine your body is producing. As a result, it can help your body flush out excess minerals like potassium and sodium. Excessive mineral build-up can cause health issues like kidney stones. Due to the anti-inflammatory and antibacterial properties of geranium oil, it can be a help with various infections and inflammation in the body. To prevent wounds from becoming infected, just carefully rub in a few drops of geranium oil in and around the area of the wound. In the case of health issues like respiratory ailments and colds, using the vapors of geranium oil can help reduce inflammation and clear out some of the bacteria. You can easily do this by adding a few drops of the oil in your humidifier, or into a pot of boiling water and inhaling the fumes. Geranium essential oils can help stimulate blood circulation, which, in turn, may help speed up the healing process. It works best if you take a few drops of geranium oil and rub it into the area that needs healing. Although there is currently no cure for Alzheimer’s disease, geranium essential oil may be able to help control it and help with symptoms. The citronellol content in geranium oil can trigger microglial cells, which can help prevent the inflammation of neural pathways. As a result, it may help prevent conditions like Alzheimer’s. In addition to these health benefits, geranium essential oil can also help you out a great deal if you have issues with acne. Geranium essential oil may be able to help with acne and other similar skin conditions. Acne is often caused by bacteria and skin debris that has taken up residence in your pores. But, you should note that there aren’t any full studies to date on the effects of the oil on acne, but there are some promising results so far. Create a mixture of a diluted geranium oil formula (use any of the recipes provided below). Clean and exfoliate your face. Doing this will help remove any dirt, debris, and excess oil that may be causing the acne. Using the mixture of your preference, take a cotton swab and apply the mixture directly to the problem areas. Alternatively, you can also use a cotton ball dipped in the mixture to clean large parts of your face. Here are a few recipes for geranium essential oil mixtures that you may find useful for acne treatments. This recipe is very simple and quite effective to treat acne. You can also use a small spray bottle for this mixture and use the spray nozzle to apply the mixture to your face. This recipe works best if using fresh aloe vera gel from the leaf of the plant. Also, aloe vera has numerous antibacterial and healing properties, as well as a cooling effect on the skin. Geranium oil is easy to make once you have the right ingredients and follow the right steps. Here is a simple recipe that you can try in your own home. Gather fresh geranium flowers, stems, and especially leaves as they carry the most oil. Fill half a jar with these items. With a wooden spoon or dowel, gently stir the leaves and sticks with a gentle pressing to help release the oil. Be sure not to crush or mash them. Pour a carrier oil over the plant pieces until they are fully covered. We suggest using olive, jojoba, or almond oil. Tighten the lid on the jar and leave it outside in direct sunlight for at least 48 hours. Make sure to stir or shake up the contents every few hours. Strain the contents of the jar into a tinted glass bottle or container using a funnel and a fine cheese cloth or another filtering device. Doing this will prevent the debris from going into the bottle. Place a tight lid or cap on to the bottle. It’s a good idea to date the bottle as homemade geranium oil like this will lose potency after six months. The potential for geranium oil to assist with your health is there. And, there is some science to back it up. However, full studies still need to be done to test what exactly its benefits are, as well as its effectiveness. Dean, S., “How To Use Geranium Essential Oil For Acne Treatment,” Always Healthy Living; https://alwayshealthyliving.com/geranium-essential-oil-acne-treatment/, last accessed August 14, 2017. Chandler, B., “How to Make Essential Rose Geranium Oil,” Livestrong, August 16, 2013; http://www.livestrong.com/article/198806-how-to-make-essential-rose-geranium-oil/, last accessed August 14, 2017. “Go the Extra Healthy Mile With Geranium Oil,” Mercola, August 25, 2016; http://articles.mercola.com/herbal-oils/geranium-oil.aspx, August 14, 2017. Nex, M., “Using Geranium Oil for Acne,” Skin Disease Remedies, June 2, 2016; http://www.skindiseaseremedies.com/geranium-oil-for-acne/, last accessed August 14, 2017. Elmann, A., et al., “Anti-neuroinflammatory effects of geranium oil in microglial cells,” January 2010; 2(1): 17-22; http://www.sciencedirect.com/science/article/pii/S1756464609000796, last accessed August 14, 2017.